I love my garden, but my deck gets incredibly hot in the late afternoon summer sun; and we have no patio screen. We had built a covered patio in my last home, but we have not yet gotten around to it in the new home. 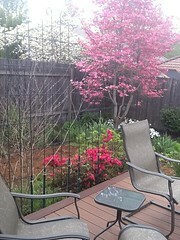 Sitting on the deck in the morning is wonderful and mid day is tolerable as long as I have the umbrella open. However, the late afternoon sun is impossible, as the umbrella can’t screen the sun when it drops too low in the sky. If we want to sit outside, we retreat into the front yard where there is a cooling, very large burning bush. The challenge has been what to do for a shade screen to block out the late afternoon sun. We have too many other home projects to make building a patio cover a priority, but we still want to use the patio. We also live downslope from our neighbor and would like a little more privacy. Today a quick and easy solution occurred to us. The best part is we already had all of the materials. We have some very nice interlocking trellises, some of which had come clematises growing on them. The rest were being unused. We decided to use different trellises for the clematises and see if we could use them next to the patio so we could use them to form a sun screen and privacy screen. We put in the first trellis and liked it. We put in the second trellis and linked them together. The only problem was supporting them somehow to stay upright without side supports. We put in the other three trellises, linked them together and used some green metal garden stakes to secure them. It looks great for a temporary patio screen solution or maybe even a permanent one if this works as well as I think it will. They seem to be quite stable with the garden stakes. We do plan to get some shepherd hook bird feeder poles to stabilize the ends. Then we can use them to hang some flower baskets on. We plan to hang some shade screen cloth from the tops of the trellises to block that late afternoon sun in our garden and deck. Later, we can grow clematis or other vine up the trellises. We still don’t have our patio table on the deck for the summer, but I can’t wait to start enjoying our deck in the late summer afternoons. And just think, our patio screen took us all of 45 minutes to set up.